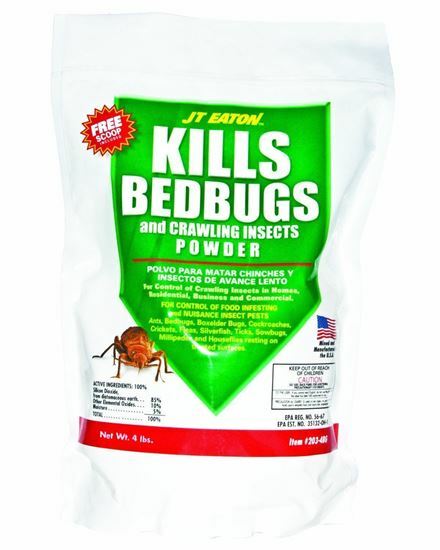 The JT Eaton 203-4BG Bedbug and Crawling Insect Powder has the active ingredient Diatomaceous Earth (85-percent) to kill bed bugs, ants, cockroaches, crickets, fleas, ticks and other insects. This powder kills by absorbing the fluids from insects leaving them to die of dehydration. This is a product that insects never become resistant to. This powder can be placed in any problem area however, be careful around children or pets. This product comes in a tamper evident reseal able pail. 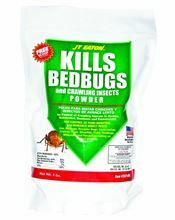 The JT Eaton 203-4BG Bedbug and Crawling Insect Powder comes with a 1-year limited warranty to protect against defects in material and workmanship. JT Eaton's mission is to manufacture and distribute products designed to eradicate pests. We continually seek out new ways to provide consumers with the knowledge and products they need to create a healthier and safer world. JT Eaton has been family owned and operated since 1932 and they manufacture and sell only the highest quality products.